It has been a short time since Huawei E5377 4G Mobile router is available on the market. 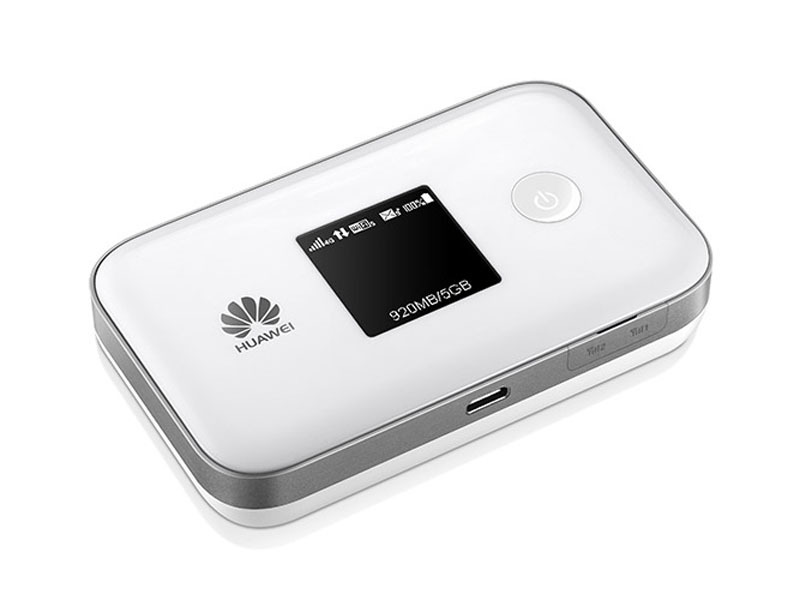 Now there is a new mobile LTE hotspot Huawei E5377T available which combines a very good quality with a strong battery. Up to 12 hours working time is possible with the E5377T MiFi router. The Huawei E5377T is very technically similar with its sister model Huawei E5377, which also has LTE with up to 150 Mbit/s download speed, Wi-Fi 2.4 GHz and 5 GHz as well as a wireless extender function. The main difference is the design and battery. Today we will take some test for this new pocket router. Before the test, it’s necessary to review the technical specifications of the Huawei E5377T. The support bands should be only for the version E5377Ts-32. Huawei sold the device even with slightly modified number in other markets, then the support bands may vary. The Huawei E5377T is packed in a cardboard box, where the most important technical data are shown. Next to the device itself, there is a plug adapter with USB port and a short USB to Micro-USB cable to charge the mobile WLAN hotspot. At first glance, the Huawei E5377T is packaged in white high-gloss plastic and is surrounded by a silver trim ring. On the front you will find a monochrome display and the power button. On the upper side, there is a menu button on the lower side and the Micro-USB port for charging. In addition to the micro-USB port, there are also two CRC-9 connectors for an external antenna. The compact dimensions and the comparatively strong battery of 3,560 mAh make Huawei E5377T look quite thick, the weight is higher than many other mobile LTE hotspots. 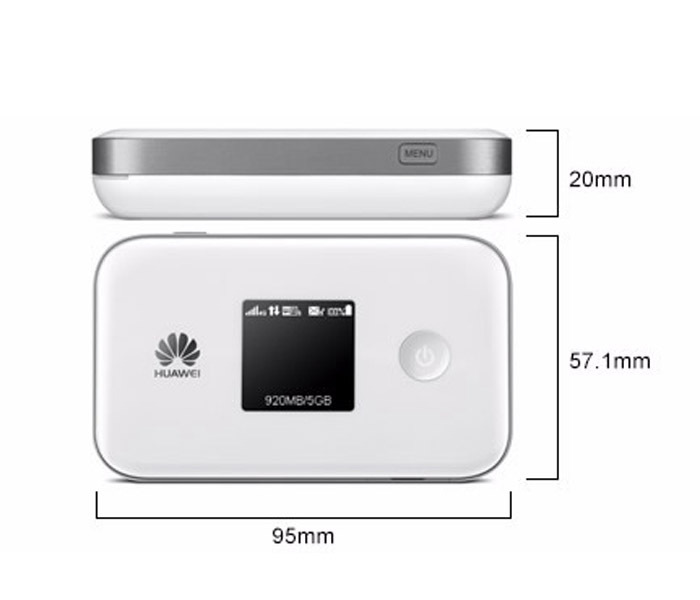 The establishment of Huawei E5377T is quite simple: first you open the battery compartment and inserts the SIM card. It will also work with nano(with card adpater) and micro-SIM card, here one should be a bit careful, so as not to damage the contacts. After the battery is inserted and start the router via the power button. Since the wireless connection is secured, you have to enter a password: this is with the wireless network name in the battery cover or the display of the device. Now you only have to enter the PIN code, then the internet is already connected to the Internet. There are two methods to enter the PIN code and do the general operation and configuration of Huawei E5377T. First, of course, the web interface, which is accessible from any browser at the IP address 192.168.8.1. Secondly, it’s possible to control over the Huawei HiLink app from smartphones and tablets. The app can be download either in the App Store search, or you can directly scan a QR code that is shown on the device. The configuration is done completely automatically. Nevertheless, the web interface or the app for many users will be important, for example, to change the wireless network name and password, or to view the usage statistics. Also the optional MicroSD memory card can be accessed through the web interface and app. The modem of Huawei E5377T is Huawei HiSilicon. The maximum speed is 150 Mbit/s for the downlink and 50 Mbit/s for the uplink, this must be posted in the LTE network and the network operators support these speeds. LTE Cat6 with Carrier Aggregation is unfortunately not supported, if you prefer LTE cat6 for even faster speeds, you have to turn to Huawei E5786. Of course the Huawei E5377T is also backward compatible with GSM and UMTS. In 3G network via DC-HSPA+, download speeds of up to 42.2 megabits per second in the downlink are possible and HSUPA up to 5.76 Mbit/s can be achieved. User can setup the preferred network in the web interface and app. Sometimes, the network signal is weak, you can also connect an external antenna. These are two CRC-9 ports. With external antenna, the device can get stable and better network. Maximum 10 devices can be connected wirelessly via WLAN from the Huawei E5377T simultaneously. Another one unit can use the Internet connection via USB cable. It’s sparked either the 2.4 GHz band or 5 GHz band. Although the latter has a shorter range and is not supported by all devices, but it offers a much freer connecting, making it at trade fairs or big events easily available. The wireless band can be adjusted directly on the device via the small screen by the menu and power button, a simultaneous operation of both frequency bands is not possible. The maximum speed via WLAN is 300 Mbit/s. Unfortunately, the latest WLAN ac standard is not supported. 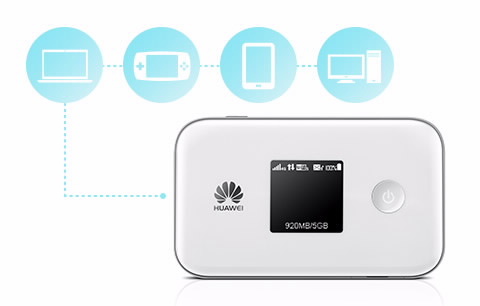 The Huawei E5377T has another special feature: the Wireless Extender. The Wireless Extender mode is directly switched on the device via the small screen by the menu and power button, however, the configuration is done via the software. The battery has a capacity of 3,560 mAh and can be easily replaceable by the user. Under the battery there is the slot for the SIM card (standard size 2FF) and the MicroSD memory card. In addition, user can find the information about the access for wireless and web interface and device-specific information such as the IMEI number. The battery provides the manufacturer for a period of about 12 hours. The Huawei E5377T is a good mobile LTE router. Despite heavy battery, the model is quite compact and can be taken easily in pocket. The functionality is with Dual Band WLAN, LTE Cat4 and connections for an external antenna and worked well in the test as you would expect. All you get with the Huawei E5377T is a very well-equipped mobile LTE router, which you can recommend without restrictions.